Sarah Millfelt, Executive Director © 2019 Northern Clay Center. All rights reserved. No part of this book may be used or reproduced in any manner whatsoever without written permission, except in the case of brief quotations embedded in critical articles and reviews. For information, write to Northern Clay Center, 2424 Franklin Avenue East, Minneapolis, MN 55406. www.northernclaycenter.org Manufactured in the United States First edition, 2019 International Standard Book Number 978-1-932706-50-X Unless otherwise noted, all dimensions: height precedes width precedes depth. This activity is made possible by the voters of Minnesota through a Minnesota State Arts Board Operating grant, thanks to a legislative appropriation from the arts and cultural heritage fund, and a grant from the Wells Fargo. Additional funding and support for In Service: Engaging and Connecting Through Clay comes from and Anonymous Donor, Continental Clay Company and the Windgate Foundation. with their inner ceramic artist and pursuing lifelong learning opportunities in clay. 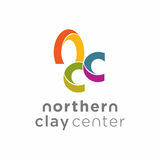 With all of the inherent opportunities for engagement that NCECA creates, what better exhibition to be hosted by Northern Clay Center during the conference than In Service: Engaging and Connecting through Clay, which is curated by Ursula Hargens, a ceramic artist, talented educator, and passionate member of the local ceramics community. In Service: Engaging and Connecting through Clay underscores a growing trend in the craft field: creating opportunities for social engagement through the process of making. In this exhibition, we highlight both artists and initiatives committed to creating meaningful community dialogues, and we included ceramic work made by those sitting at the table as well as those who benefit from this outreach. This show has been percolating in the mind of our curator, Ursula Hargens, for some time. My own desire was to explore the idea of engagement, not just through the lens of the ceramic artist initiating such, but through a more holistic approach, highlighting efforts from the local potter next door, to the grass roots efforts of a community, to organizations whose work has a national and international impact. We spent much of calendar year 2018 developing the partnerships, activities, and engagement that informed and complimented this exhibition. We pursued a new iteration of a much respected initiative: the Democratic Cup: Land of 10,000 Stories, in collaboration with Ayumi Horie, and with Nick Moen of the Bright Angle. We travelled across the state of Minnesota to host community conversations and our stops included New London, Grand Rapids, Winona, and Northfield. much of your time with this exhibition and all of NCC’s NCECA preparations in general; your output far surpassed my personal expectations (which you know are always set ridiculously high). Thank you to Jill Foote-Hutton for her responsive and consistent work from afar and for ensuring Jeff Schmuki’s portion of the exhibition was so thoughtfully coordinated and his visit so deeply connected to our constituencies. Thank you to Alison Beech for almost two years of planning and development of NCC’s collaboration with our immigrant neighbors. The gorgeous objects featured in the exhibition are a mere snapshot of the magnitude of our programming efforts with this populace. Thank you to the program partners and interpreters who introduced us to new neighbors and who support our efforts in the classroom. Thank you to the best outreach teaching team in the country who brought their compassion and talents to the classroom each day. Thank you to the designers of the ceramic cups and the illustrators: you took a leap of faith on this project and forfeited studio time to enable our efforts with The Democratic Cup. Thank you to our ambassadors for risking reputation, giving us hours upon hours of your time, and inviting us into your community. Thank you Ayumi and Nick for sharing your initiative, for trusting our intentions, and for collaborating on this project. This exhibition, all of NCC’s NCECA-centric programming, and my time in general spent as an onsite liaison for the NCECA conference planning, have yielded the most learning moments for me professionally and, equally, the most pride. I sincerely hope you enjoy this publication and its encapsulation of what is one of the most amazing exhibitions I’ve been part of in my tenure at NCC. Notes: 2	Jeff Schmuki, phone interview with author, 23 Jan 2019 3	Jeff Schmuki, email message to author, 2 Feb 2019. 4	Jeff Schmuki, phone interview with author, 23 Jan 2019. 5	Lisa Blackburn and John Hartom, “Empty Bowls Project,” SchoolArts, October 2007, www. davisart.com/Promotions/ SchoolArts/PDF/ EmptyBowls_10_07.pdf. 6	Lisa Blackburn and John Hartom, “Empty Bowls Project,” SchoolArts, October 2007, www. davisart.com/Promotions/ SchoolArts/PDF/ EmptyBowls_10_07.pdf. 7	Sarah Bagwell, Powderhorn Empty Bowls President, email message to author, 17 Dec 2018. 8	Robert Silberman, 1999 Distinguished Artist Award Catalogue, McKnight Foundation, p. 15. 9	David Lewis, Warren Mackenzie: American Potter, Unicom Management, Inc., 2006, p. 195. 10	As quoted in “Remembering Warren,” accessed 22 Jan 2019, www. northernclaycenter.org/ remembering-warren. seen — in context and in use. Robert Silberman, who has written extensively on MacKenzie, asserts, “MacKenzie holds a democratic view of pots. I suspect that, after the right to vote, MacKenzie would next uphold the right of all citizens to have good, affordable, handmade pots, with their most important civic duty being to use them.”8 As someone who made pots throughout his career, MacKenzie understood that craft objects tell stories and link people together through shared history and meaning. They form direct communication between maker and user. MacKenzie believed that getting to know a pot takes time and that a “slow understanding” builds over years between maker and user, creating community and expressing a common human experience.9 He once said, “I want to reinforce the sense of traditional values in people. The sense that in our brief tenure on this earth, in spite of the great problems we face, there are larger themes, maybe even timeless themes which transcend us. At the same time, I want my pots to express those themes with immediacy and emotional spontaneity.”10 In MacKenzie’s view, pots have the ability to connect us — to convey a common humanity, create connections between individuals, and democratize the art experience. The objects themselves are relational objects that carry content and create deep, intangible links within communities. The impact of MacKenzie’s philosophy and actions have rippled through the generations of studio potters he inspired and mentored. Many potters working today can trace their lineage to MacKenzie, and his influence in the region cannot be overstated. Through his life as a studio potter, teacher, and advocate for ceramic education, he fostered a vibrant ceramic community in Minnesota. The friends and colleagues, who settled near him in the St. Croix River Valley, fired kilns, organized sales, and ate together. They formed an engaged community that considered the way objects carry social value. They incorporated this understanding into their working methods and interactions with the public. MacKenzie’s lifestyle epitomized socially engaged craft through a community-based, object-focused art practice. It was this practice, sustained over decades, replicated by many, that built and transformed communities. Using handmade functional pots to form meaningful human connections is, perhaps, his most lasting legacy. These values, embodied by MacKenzie, continue to inspire potters across America. Notes: 11	Outreach classes were held at: Seward Tower East, Seward Tower West, Cedar High Apartments, Riverside Senior High-Rise, James R. Heltzer Manor, Village at Franklin Station, Matthews Recreation Center, and Hiawatha Towers. 12	Alison Beech, NCC’s Manager of Community Engagement, email message to author, 1 Feb 2019. 13	English Interpreters: Hibo Abdi, Jima Ahmed, Tefsa Balcha, Abdurahim Buse, Ismail Harun, Suleiman Isse, Catherine Lee, Abduselam Mohammed, and Aden Samatar. NCC Teaching Artists: Elizabeth Coleman, Risa Nishiguchi, Claire O’Connor, Angie Renee, Chris Singewald, and Lucy V. Yogerst. Community Liaisons: Deqa Adan, Faisal Aideed, Ahmed Bani, Katie Bartels, Kerry Cashman, Scott Krueger, Marilyn Matheny, Aisha Mohamed, Bill Melton, Andrea Nettles, Nasra Noor, Mahdi Nur, Rhonda Peterson, and Melinda Struder. 14	Claire O’Connor, NCC teaching artist, email message to author, 29 Jan 2019. 15	Risa Nishiguchi, NCC teaching artist, email message to author, 26 Jan 2019. 16	The Democratic Cup Conversation Toolkit, accessed 22 Jan 2019, cdn.shopify.com/s/ files/1/1280/4739/files/ THE_DEMOCRATIC_CUP_ CONVERSATION_TOOLKIT. pdf?5170164826150716874. 17	Ayumi Horie, “Introductory Letter to Participants,” emailed to author, 7 Sept 2019. 18	The Democratic Cup Conversation Toolkit, accessed 22 Jan 2019, cdn.shopify.com/s/ files/1/1280/4739/files/ THE_DEMOCRATIC_CUP_ CONVERSATION_TOOLKIT. pdf?5170164826150716874. 19	Our creative partners are all residents of the state of Minnesota. Ambassadors for this project included ceramic artists Nathan Bray, Bill Gossman, Lisa Truax, and Julianne Shibata. Form makers included Linda Christianson, Brett Freund, Peter Jadoonath, and Elizabeth Pechacek. Illustrators included Jaime Anderson, Kim Bogeman, Ann Ryan, and Julie Van Grol. Northern Clay Center’s Seward Neighborhood Outreach The Seward and Cedar-Riverside Neighborhoods, in which Northern Clay Center is located, are the center of East African immigration in the United States. The Cedar-Riverside neighborhood is often referred to as “little Mogadishu,” and Minnesota’s Somali population is considered one of the largest Somali diasporic communities in the world. NCC has a history of creating deep-rooted outreach programs, especially in historically underserved communities. In 2014, NCC set out to increase access to the ceramic arts among the East African refugee and immigrant populations in the immediate neighborhoods. Teaching artists held multi-week workshops at NCC and in the nearby apartment towers where many East Africans live. NCC’s efforts continued on a larger scale in 2017 and 2018, and they partnered with three local organizations, Seward Neighborhood Group, Matthews Recreation Center, and the VOA High-Rise Social Services.11 With funding from a Minnesota State Arts Board Arts Access Grant, NCC hired translators to work with its outreach teaching artists since participants from Somalia and Ethiopia speak many languages including, Somali, Arabic, Oromo, Amharic, and Tigre.12 Additionally, activities drew participants of Korean, Indigenous American, and European American descent. The translators were critical in cultivating connections between instructors and participants, conveying content, enabling discussions, and sharing jokes within the group. The pieces in the NCC gallery exemplify work made in 94 ceramic classes held over a 12-month period. The rewards of this type of outreach are hard to quantify, but it is clear from interviews that the experience of working in clay opened avenues for cultural interaction and exchange between teaching artists, translators, participants, and, by extension, with NCC.13 As teaching artist, Claire O’Connor, recalled, “Weekly, as we worked, I heard [from participants] about pastoral lives in their homelands, about refugee camps where many were forced to shelter from chaos and violence, and, finally, about immigration and settlement in a new and very different culture.” As teaching artists listened to the life stories of these immigrants, participants engaged in clay as a way of sharing in local cultural values. Since many immigrants don’t have a lived experience with ceramics, they learned to appreciate a material and way of working that are part of Minnesota’s local culture.14 Clay became familiar, and NCC became a welcoming place with which they had a new connection. Notes: 20	Potters for Peace, “About Us,” access 19 Jan 2019, pottersforpeace.org/?page_ id=8. 24	“Water Filter Project,” accessed 19 Jan 2019, pottersforpeace.org/?page_ id=63. 21	Robert Pillers, Nicaraguan Water Filter Coordinator, email message to author, 6 Nov 2018. 25	Robert Pillers, Nicaraguan Water Filter Coordinator, email message to author, 25 Jan 2019. 22	“Water,” accessed 19 Jan 2019, www.un.org/en/ sections/issues-depth/ water/. 23	“An Economic Crisis,” accessed 19 Jan 2019, water.org/our-impact/watercrisis/economic-crisis/. 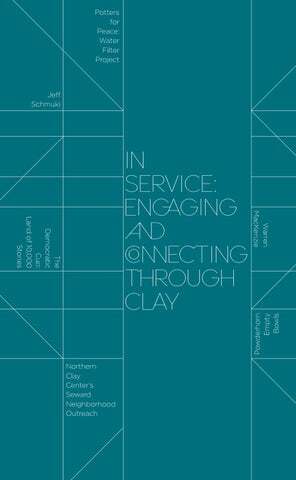 Each of the six partners represented in In Service leverages the unique properties of clay and its role as a social object to engage communities and effect social change. These initiatives, installations, and pots illustrate the creative potential and enduring impact of ceramic materials. Clay is transformative. It opens avenues for meaningful exchange and interconnection. When raw clay is transformed into a ceramic object, it connects us to the most fundamental aspect of our shared experience as humans — the need to grow, store, serve and share food. But clay is also a technology with transformative health and economic benefits. It is entwined with our sense of community, humanity, and purpose. In Service calls upon us, as ceramists and as human beings, to examine and renew our commitment to forging connections, imagining new possibilities, and using our talents to create a brighter, cleaner, more equitable, and just world. Unless otherwise noted, all photographs are by Peter Lee. Design by Joseph D.R. OLeary, VetoDesign.com.